...and when I try the versions one-by-one (0.4.5a/b/c , 0.4.6a) do I have to edit the boot code as well? I mean will a simple grldr overwrite be enough? Sure, that would be normally enough, if the grub4dos is "installed" to hard disk the grldr.mbr is usually capable of loading *any* (recent or recent enough) grub4dos, but you may also want to use an indirect grldr loading method (such as using NTLDR or BOOTMGR and a BOOT.INI). Also there are two "levels" of possible causes. One is something in the way the specific grub4dos versions which is not 0.4.6a vs. 0.4.5c "series" only, BUT also (example) grub4dos-0.4.6a-2016-04-11 vs. grub4dos-0.4.6a-2016-01-19 and between a (roughly same version) of a DIFFERENT "series", (again example) 0.4.6a-2016-01-19 vs. grub4dos-0.4.5c-2016-01-18 interact with the BIOS. The other one is the possibility that the commands in the menu.lst entry you are using are incompatible with the BIOS and need to be specifically adapted, as a matter of fact writing a menu.lst entry should be the LAST thing one does as when experimenting or debugging an issue one should use command line and command line only, as this allows for interactively get form the system the currently available devices, their mapping, etc. Of course is not "easy" and takes a lot of time and tests to pinpoint such an elusive issue as the one you are having. or does it happen when you add *any* package or does it happen also with an "untouched" .iso? I mean could it be *something* in the exact way you modify/create the .iso that affects the (failing) booting? (be it the actual method or the actual specific packages)? Which, in your opinion, is the best version for compatibility with most devices (computers, laptops)? Yesterday I tested all major versions (0.4.5a, 0.4.5b, 0.4.5c, 0.4.6a) from chenall builds and none of them worked. I'll have to start with year-builds. As said, BEFORE doing that "blind testing" I would rather try to find what the issue is, however a 0.4.5c-2015-05-18 is usually good in my experience. will it work when mapping to --mem? or mapping to (0xff) drive instead of (hd32)? is there a need (if possible at all) to do some re-mapping or forced mapping of the disk(s) with that particular DELL Bios? could it be a quirk of the "advanced/latest" GENERIC 0.4.6a series (that counts NUMBERLESS versions)? would one of the "more conservative" versions of the generic 0.4.5c series work? You are seemingly two steps behind . If windows "setup" boots on the given machine and "your PE" doesn't, it is more probable that it is "your" PE that has *something* wrong. Can you confirm that on one of the problematic machines an UNTOUCHED Windows 7 install .iso image works fine and on that same machine, using the same grub4dos version and menu.lst entry "your" .iso fails? I've finally fixed the error by using grub4dos-0.4.5b-2010-12-31. This is the only version that works, tried all of them. The images affected were standalone WinPE images but also Windows Installer Disks (tried 7, 8.1, 10). All of them were freezing at the exact point: the boot logo. Using the above version all of them worked. Now, I have a new question and hopefully you will be able to advise on the matter. I'd like to use two versions of Grub4DOS on demand. Like say one does not work, boot the other, manually of course. Can this be done by chainloading grldr from one another? If not possible, care to share a possible way to this? I'd like to use grub4dos-0.4.5b-2010-12-31 and grub4dos-0.4.5c-2015-05-18. you can also rename one of the two grldr's to something else (though there are some strings attached in theory with the renaming, in practice it works nicely). But it is possible that around that time something changed in some "defaults" so that it is entirely possible that a later version works as well but needs some additional command. I quickly checked the changelog and at first sight I cannot see anything around december 2010/january 2011 that can be related to your issue. If you can pinpoint the exact very last version that works and the very first one that doesn't, maybe we can understand what the cause of the issue is. Also (additionally, I know) would a slightly earlier version work? So I've done many tests on grub4dos and found that grub4dos-0.4.5b-2011-07-14.7z is the last working version on my machines. Maybe you could do some investigating and reveal what has changed from this version and up. I'm really curious. 2011-08-05 (tinybit)added a map option --e820cycles for Dell Laptop N4030. 2011-07-27 (tinybit)fixed a careless mistake in clean_entry(). 2011-07-21 (tinybit)added a map option --int15nolow. Some changes on handler. For some strange reasons the DELL Bios have been troublesome since the dawn of time, and it is very possible that the same issue affects various models, but are you using on them the Corsair USB 3.0 stick you mentioned? It could also be a combination of BIOS with specific stick. I'll try the map --e820cycles=0 option on monday and say for sure. But what I know right now is that the latest grub4dos grub4dos-0.4.6a-2016-04-13.7z does not boot at all. It only shows a black screen, and does not load the grub4dos menu. Show I will be forced to use multiple versions of grub4dos. Maybe is part of the same issue with a specific (flawed) BIOS. Try with a floppy image. Open it in 7-zip (or whatever tool you use) and get out of it the file fat12grldr.img, mount it in (say) IMDISK and replace the grldr with the version you want to try. I'm back with my test results. First the command map --e820cycles=0 works on my old machines using grub4dos 0.4.5c and 0.4.6a. But I'll still be using the floppy image created of the older grub4dos just for safety. And it freezes at that point. No matter what entries I write in the file, it still freezes. I left only the basic HALT and REBOOT entries in it and still froze. All other G4D versions after 2016-03-03 just display a black screen, not even an error code or message. Probably is related to the above error. have same problem. black screen, when making WIM build model. but all work fine, when making Normal build model. how to log&debug WIM booting process? 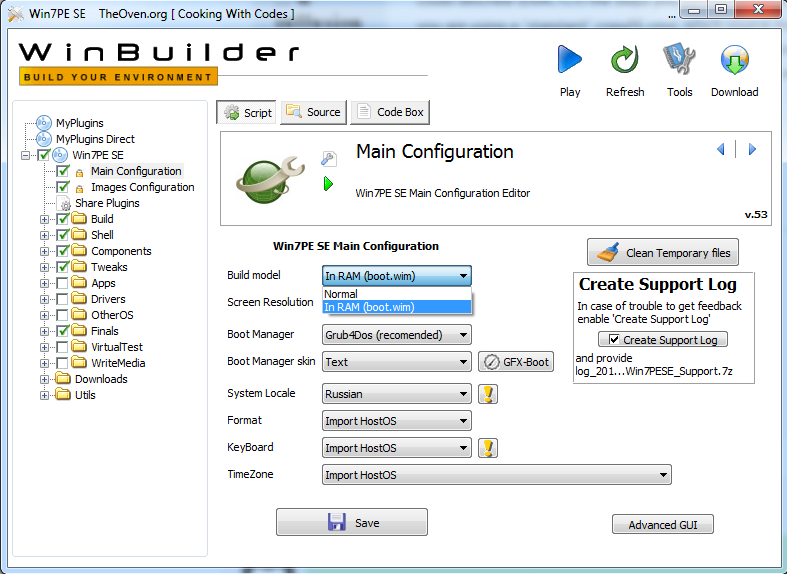 Try explaining to use what do you mean by "WIM build model" and what you mean by "Normal Build Model", ideally if you could describe (EXACTLY) the steps you perform while making th eone and the other build, which specific PE version is it, if you are using a "standard" copyPE cmd, which source media are you using, on which hardware you are trying it, how (very EXACTLY) you are trying to boot it, etc. you would be giving us the informations needed to try and help you. The "effects" viewable in the video could be caused by several different things, including badly configured startup scripts (winpshl.ini, etc.). sorry, i mean this settings "Build model"
but on other computer (home), same the WinBuilder config, makes good ISO with "In RAM" model. both computers with Win7 Pro x64 RUS and last updates from MS, UAC disabled. I think better to give both .iso files for inspection. You need some support from someone more familiar with Winbuilder and with the specific project. In any case you should provide the two logs (the one that works and the one that doesn't). See on the right of the image you posted the "Create Support Log". Loosely, what is happening is that the "in RAM" is wholly loaded in RAM, so once it is loaded it works, whilst the "other" needs a later access to the media and (for *whatever* reasons it doesn't work. which is the (new) home of that Win7PE_SE project. Edited by ashfor, 08 July 2016 - 11:04 AM. when i added read permission to Users group for source dir and winbuilder dir - problem gone.